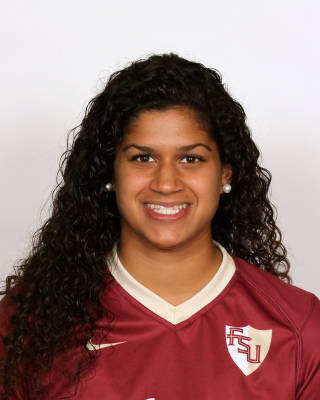 * Appeared in six matches in her first season at Florida State. * Made her collegiate debut in the second match of the season at home against Auburn…tallied a season-high 14 minutes in the win over the Tigers. * Saw action against Miami and Pittsburgh during the ACC regular season. * Played in a pair of NCAA Tournament games against South Alabama and Colorado. * Led Flint Hill High School in scoring and assists in each of her four years. * Garnered All-MET first team honors as a senior…and All-MET honorable mention accolades as a freshman, sophomore and junior. * Earned All-ISL first team honors all four years at Flint Hill. * Named school MVP all four years, while serving as team captain as a sophomore, junior and senior. * Recipient of the NSCAA Senior Excellence Award. * Called into camp with the U-18 U.S. National Team in 2012. * Member of the Jamaican U-20 National Team in 2012. * Served as captain and starter at the center midfield position in every match in 2012. * Played in the CONCACAF U-20 World Cup qualifier. * Scored twice for the Jamaican squad in the Caribbean Cup. * Member of the McLean ECNL ’94 club team. * Named to the All-Tournament team at Disney and PDA. * Daughter of Edward and Beverley Sweatman…has an older sister Brittany and two older brothers Ryan and Kyle.